We all want to make sure our employees use their Sunlight to hone their skills and acquire new ones, and we want to give as much freedom in this as possible. However, sometimes we need to set some rules before we give the freedom of choosing. This is what our spending controls are there for. Setting up these conditions on your group can help make sure Sunlight is used in a way that is aligned with your company policies. To start, you get to decide whether you want to have any approval conditions at all. You can do this by going to your group's settings and answer the question "Require Admin Approval?" however you see fit. If you select "Yes" another few fields will make themselves visible, to allow you to customize this further. 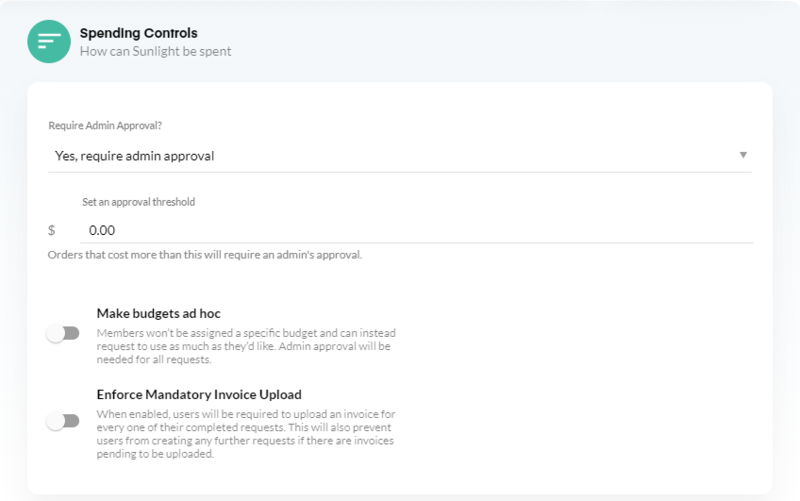 These fields are the Approval Threshold, the Ad-Hoc functionality and one that is always available regardless of your answer to the question is Enforce Mandatory Invoice Upload. To begin, we have the approval threshold. Setting an approval threshold means that any order that costs less than what you have established as your approval threshold will bypass the admin approval and will be completed as soon as the user requests it. It is not necessary to set an approval threshold, and this depends entirely on your internal policies and whatever you feel comfortable with allowing. Next we have the ability to enable the Ad-Hoc functionality. To activate it you just need to click on it and switch it on. Once again, this is not a necessary feature, and you can decide how you would like to handle your budget. If you wish to switch to or from this functionality at any point after setting it up, all you have to do is go back to your settings and changing the setting to suit what you need. Finally, you can make invoice upload mandatory. Just like Ad-Hoc, to activate this one you just have to click on it to switch it on. When you enable this feature, it is compulsory for users to upload invoices for any requests they have completed. If the user has any requests at all which do not have an invoice uploaded, they will not be able to make new requests until they have uploaded the missing ones. To make this easier and avoid confusion, your users can always find their requests with missing invoices on their transactions. To learn more about this, please visit our article on how to Upload Your Invoice to Your Completed Request. If you still have queries about this, please do not hesitate to contact us via support@sunlight.is or through our Concierge, which you can access by clicking on the green icon on the bottom right-hand corner of our page.